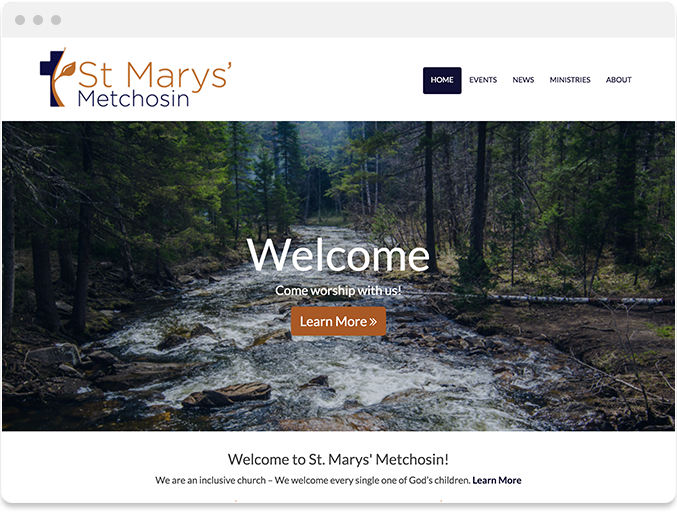 Our team has had the pleasure of equipping hundreds of churches across Canada with websites that are easy-to-use and help them reach young families. Working with the Anglican Church of Canada, we have now had the opportunity to assist over 70 churches and ministries, including partnerships with six diocese. 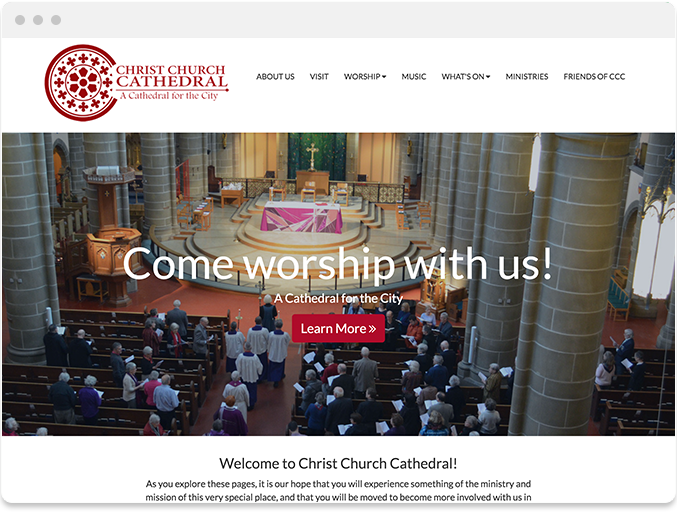 Today we are excited to showcase seven great Anglican Church of Canada websites that are powered by Ascend. This ‘cathedral for the city’ has done a beautiful job of using images from in and around their church to help a visitor visually connect with the space. This will help visitors feel more comfortable when they visit on a Sunday morning. Navigating the site feels very simple, as they’ve used language that anyone can understand, and the images help guide the eye from one step to the next. The team at Christ Church Cathedral wins the award for best use of photos. On almost every page they use a great photo to help communicate their message in a more engaging way. This helps give the viewer a place to rest their eye, but more importantly, it allows a visitor to see and experience the church. The reality is that the majority of our church attendees don’t go out of their way to pull up their church website on a weekly basis, but that doesn’t mean we don’t have important info that we need to share with them. 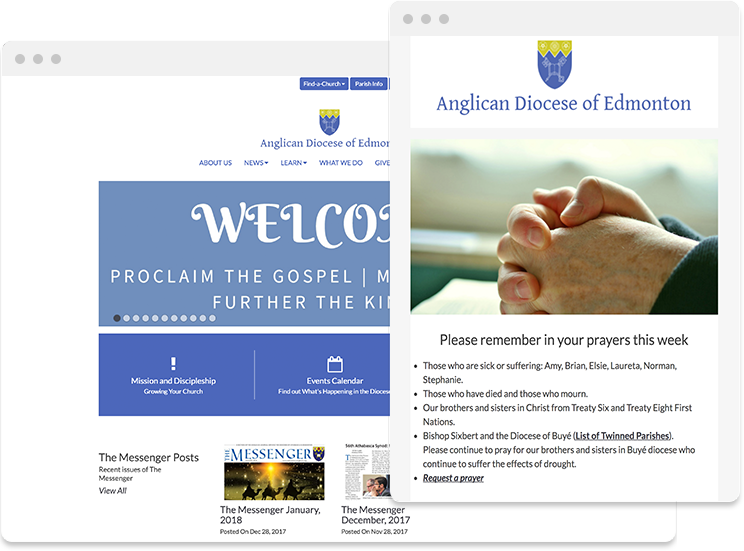 The Diocese of Edmonton has done a great job utilizing the Email Newsletter feature to keep the parishioners and clergy throughout the diocese up-to-date. They use engaging images, concise text and quick links to their website to get all their info out in an clear and effective way. We love how St. Mary’ utilized the photo on their home page to immediately establish their pride and connection to the environment surrounding them. Situated amongst the rivers and forests of Vancouver Island, the image used would help anyone from the area immediately connect. 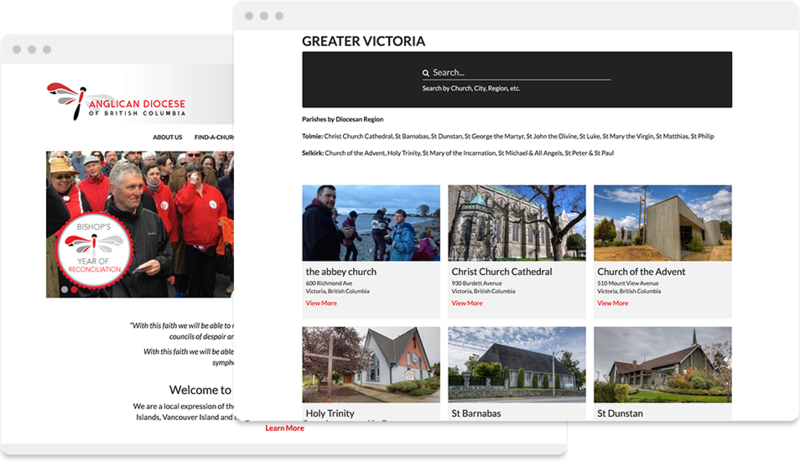 With the creation of the Diocese of British Columbia website, we watched the Ascend platform transform into a powerful church directory and resources guide for the parishes of the Diocese. 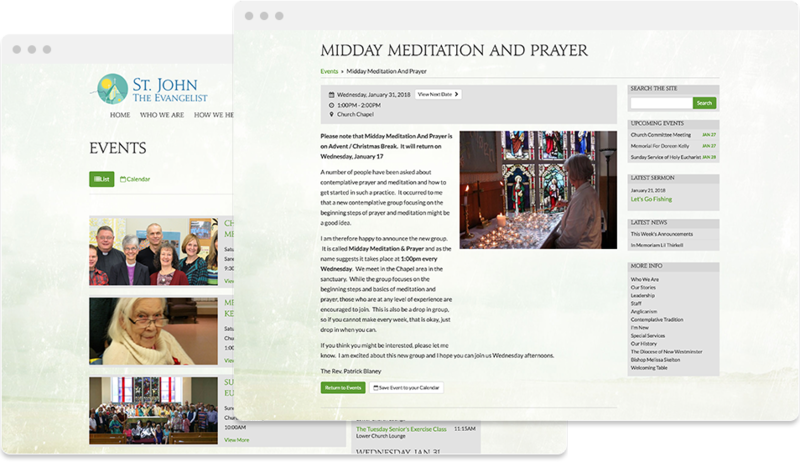 Catherine and the team at the Diocese have done a great job organizing resources, contact details and helping turn their site into a powerful tool. The team at St. Martin’s takes the time each week to post their written messages to their website. This accomplishes a few great things. First, it allows someone who missed service to still catch up on the message. It’s a chance for a visitor to learn and also get a sense of what the church is teaching. Finally, this is also a great way to keep your website feeling fresh and up-to-date on a weekly basis. Many people today carry minimal cash or cheques. Providing a way for someone to give to your church, in the way they normally transact, could make a world of difference. 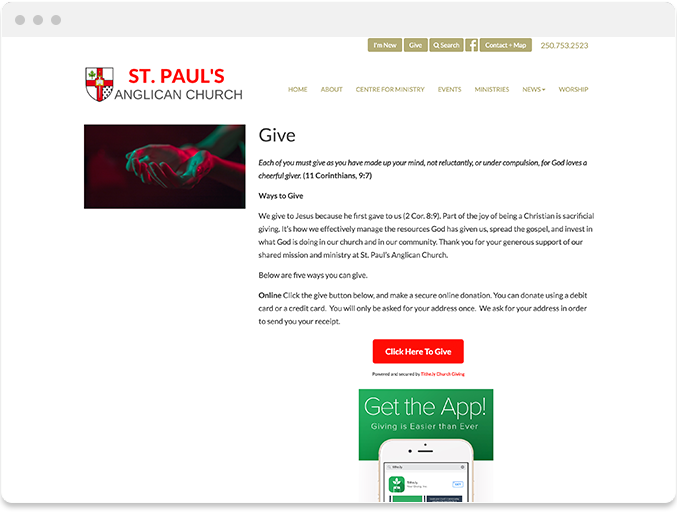 The team at St. Paul’s has enabled their parishioners with the option to now donate online through their website or on the phone through their giving app. The Rev. 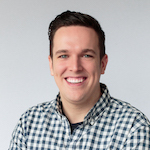 Patrick Blaney and the team at St. John The Evangelist took a great deal of pride in setting up a website that would connect with their community. They took the time to create special graphics, select the right photos, and add a special style that felt unique to their church. 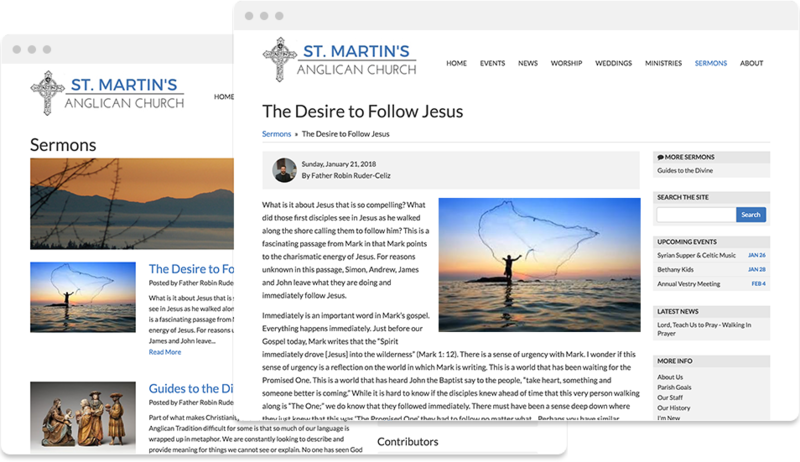 We have loved partnering with Anglican churches and it is exciting to have equipped so many of you with websites that are easy-to-use and help draw new people to your communities. On behalf of the team at Ascend, thanks so much for this opportunity and we can't wait to meet so many more of you.